La Granja is a World Heritage Site which sits at the foot of the Sierra de Guadarrama Mountains. Surrounded by outstanding beauty, King Philip V, who was the first French born King in Spain, immediately fell in love with the area, and decided this would be the place he would retire. He therefore commissioned the architects who designed the palace and gardens of Versailles, and began construction of his Royal Palace in 1721. Taking three years to build, the palace was absolutely stunning once it was completed. Its dazzling interior includes an impressive collection of paintings and magnificent tapestries, and a gallery flanked with statues that stretches the full length of the building. Within the palace is the collegiate church where the King and his wife were eventually laid to rest. The Royal Glass Factory is also located on the grounds, with a fascinating museum about the challenging art of glass-making and an exhibit of glass works. Once the King was in residence, he then spent the next two decades focusing on the gardens, turning 1,500 acres into something quite extraordinary. Over one third of the park is covered in forest, with an artificial lake hidden from view at the highest point. There are over 26 sculptured fountains that decorate the gardens and each has a mythological theme. The lake was built to become the source of water for the fountains and, even today, they still operate using the original pipes and waterworks system. Relying solely on gravity, the projection of water reaches 40m high in some cases, which made them quite infamous in their day. Only 11km away is Segovia, which is also a famous World Heritage Site. Prepare yourself for the largest and best-preserved Roman Aqueduct in the world! The Aqueduct is staggering in size, and for many centuries it was featured on Spanish coins. Segovia’s cathedral is rather magnificent as well, and was in fact the last Gothic cathedral built in Spain. However, the Alcazar is also quite special, and was a favourite residence for many of the Kings of Spain. Once you see it you will understand why it was also such a huge inspiration for (Spanish born) Walt Disney. La Granja has the benefit of its own Parador, a luxurious four-star hotel of historical importance. 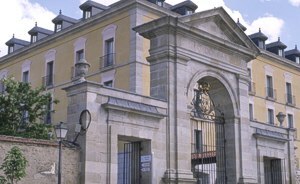 The Parador Hotel La Granja was once a Royal House and is made up of two separate buildings. The main building is the ‘Casa de los Infantes’, which was constructed for the Royal Princes in the 18th century, and has three interior patios. The second building was originally the Royal Bodyguards’ quarters, and is now used as a conference centre. 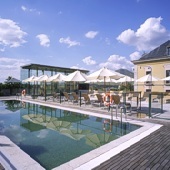 The Parador’s facilities include a spa, gym, garden and seasonal swimming pool, as well as a restaurant with an excellent menu of local and regional dishes. La Granja and the surrounding area clearly made a very powerful first impression on King Philip V. With two such amazing World Heritage Sites so close to each other, I think you can be safe in assuming it will have the same effect on you too.